With its beautiful leaves and curly bark (delightful when tufts of snow are caught in it) the Three-flower Maple is a really choice specimen. Three-part leaves are exquisite, papery in texture, medium green in summer, and have spectacular fall color. 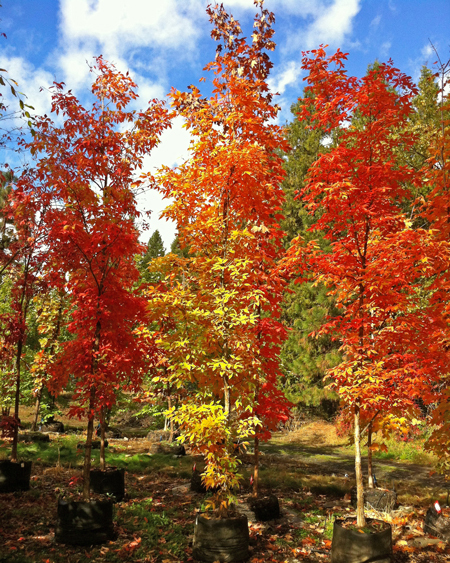 Give this outstanding tree a prominent place in your landscape. A beautiful specimen and a focal point in any border, try to site it so that the foliage is backlit for dramatic effect. An interesting grouping might be a grove of Three-flowered Maple, with other trifoliate species: Paperbark, Nikko, and Manchurian. Fascinating! An exceptionally hardy trifoliate maple with vertically fissured bark, the Three-flower Maple flakes in tight, honey-colored curls. Clusters of yellow flowers are followed by hairy samaras. Fall foliage is most beautiful, a blend of gold and claret-red. Its form is somewhat upright to spreading, twenty to twenty-five feet tall and as wide. Give it moist, well-drained soil and protect it from extreme sun and reflected heat. We are a small, family run business, and we do our best to keep things up-to-date in our e-world, however, the nature of plants to constantly grow along with perpetual inventory fluctuation at the nursery will lead to some slight differences between what you see on the website and what exactly is at our nursery. It's always best to call and speak with one of our wonderful employees regarding price and stock when considering placing an order. Thank you for your patience!